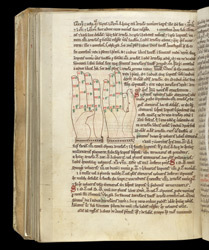 The continuation, with further diagrams, of the treatise which begins on f. 73. From this side of the leaf it is more visible that one of the hands on the other side of the leaf has been pricked, as if for pouncing. Gaps in the text, such as in the second line of text, are present because of the intended alternating red and green initials, the green ones were not executed. Next to the indentation of the final line, at the extreme edge of the leaf to the left of the indentation, the guide letter 'e' can be seen.